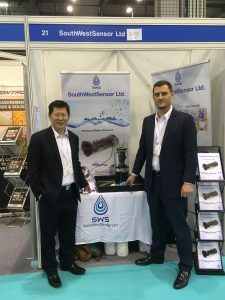 SouthWestSensor Ltd successful exhibition at WWEM 2018 – SouthWestSensor Ltd.
SouthWestSensor Ltd had an enjoyable and successful time exhibiting at WWEM 2018. This was the 8th in the series of International Water and Wastewater Monitoring Events which was held at the Telford International centre on the 21st and 22nd November. Our exhibition stand saw a steady stream of people over both days, visiting our state-of-the-art Water Chemical Sensor which sourced lots of interest and positive feedback.